iStrology is an astrology app that provides everything from your weekly horoscope to your love compatibility. The app was developed by Anime Underworld for an iPhone and iPod Touch, and it costs $0.99. For what it is, I approve of iStrology. My first instinct is to ramble on about how apps like this give astrology a bad name, but let’s be honest, astrology already has a pretty strong hold on the skepticism in everyone’s minds. This is not a sophisticated app, but it is fun and has a lot of fluff to offer. To begin with, the horoscope you are given has more than just the normal over-generalized mumbo-jumbo. Once you have fought off the Zs through reading the unimaginative banality of, “you will have to use patience…there will be many projects…take the time to think things through…” (just a small step up from reading a fortune cookie) you get a paragraph about your health and which enzyme, mineral, or vitamin you should try out this week, where you can find this wonderful elixir, and what it can do for you. After the health section of the reading you get a quote from a famous person who shares the zodiac sign that you are reading about. This passage is followed by a brief outline and history of whichever sign you happen to be viewing. In the upper right hand corner of the screen is the sign’s constellation and the illustrations of the sign’s symbols are done in an anime style. At the bottom of the screen is a list of the signs that share that particular sign’s element. 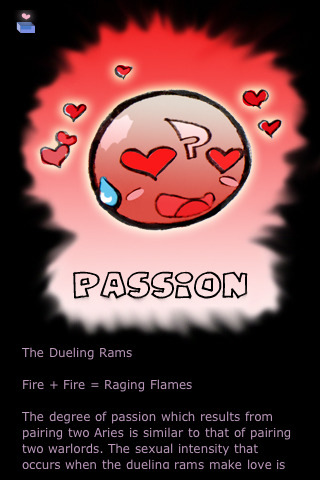 For example, if I am viewing the Aries section there is a list of its sister fire signs, Sagittarius and Leo. The two other parts of the app deal with finding a person’s sign and finding out love compatibility. If you are a beginner you can use the scrolls to enter in your birthday and your sign will appear in the corner; Virgo, Earth Sign, Aug. 23-Sept. 22. I know I have been a little harsh rating iStrology, but I am one of the freaks who love astrology so it is more of a snobby criticism. The bottom line is that this app is fun, contains useful health information, and can be a great thing to share between friends. 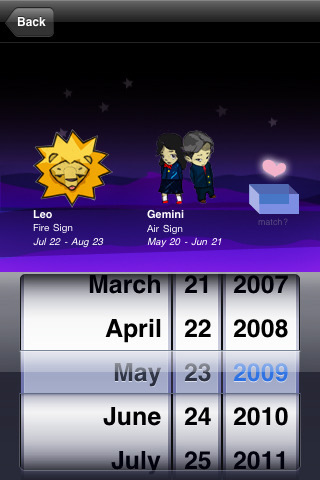 AppSafari review of iStrology was written by Vanessa Paszterko on October 25th, 2010 and categorized under App Store, Dating, Fun, Social. Page viewed 4467 times, 1 so far today. Need help on using these apps? Please read the Help Page.